Damage: User groups are liable for the first £500.00 excess insurance against any accidental damage to the vehicle, Groups will also be liable for full cost of repair against any willful damage to the vehicles interior seats, seatbelts, linings etc. Cancellations: Liverpool Community Transport must receive notice of cancellations at least 7 days before the booked journey. The full cost of the booking will be payable if this notice is not received. 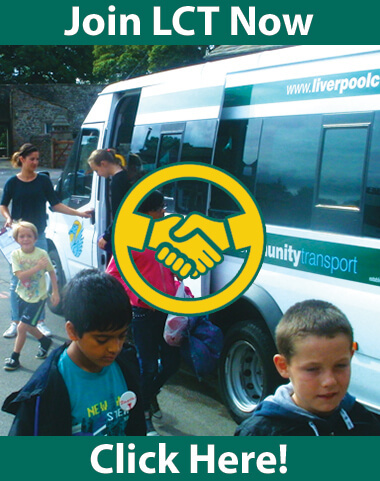 Drivers: Only drivers registered on Liverpool Community Transport’s insurance are authorised to drive the vehicles. Cleanliness: User groups are responsible for returning the vehicle in a clean and tidy condition. A charge of up to £20.00 will be made if the vehicle needs cleaning on return. Smoking, food & drink are not permitted on any vehicle. Property: Liverpool Community Transport will not be held responsible for any lost or damaged property. Personal belongings and valuables must not be left in an unattended vehicle. Baggage: Small hand luggage (eg School Bags) is permitted inside LCT’s minibuses. Under no circumstances should large baggage be placed inside the vehicle. First Aid Kit & Fire Extinguisher: The use of the safety equipment on the vehicle must be reported on return. Diesel: All vehicles must be returned with the same level of diesel as when signed out. Any group or organisation who has not replaced the diesel will incur a charge for the replacement and labour. Disclaimer: Liverpool Community Transport will make every effort to ensure that bookings are fulfilled, we cannot accept any responsibility for bookings that are cancelled for reasons beyond our control.